PastaQueen gives Fage Yogurt a second chance. Disclosure: I was sent a case of 8 Fage Yogurt cups and compensated by BlogHer to review this product. The last time I tried Fage Greek Yogurt, I was not impressed. To be specific, I said “it tasted like diaper rash cream.” Several months ago I was prodded to have it again, or more accurately I had 1/4 a bottle of agave nectar with a lil’ Fage mixed in. It was delicious! Because I love sugar like my own child! A child I would eat! Then I drank the rest of the agave nectar in two days and decided it was best not to do that too frequently. 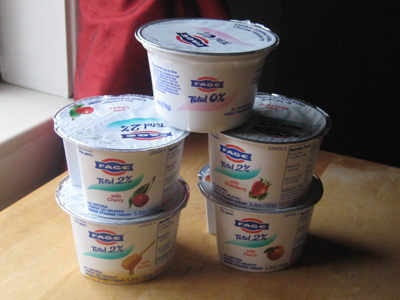 Fage Yogurt is a Greek style yogurt, which means it’s thicker. As their web site says, the yogurt is “100% natural” and “contains no sweeteners, thickeners, or preservatives.” Thankfully for people like me who frown on the “no sweeteners” policy, some Fage 2% cups come packaged with flavoring: Strawberry, Cherry, Peach, and Honey. The packaging reveals the first three have 130 calories, but the last one has 180 calories, so if you’re being calorie conscious you might want to skip the honey. The packaging for the flavor packs is rather clever. 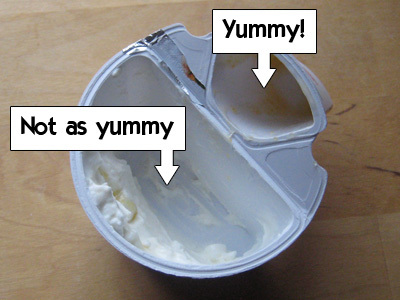 Once you peel off the foil lid, you can tip the sauce half of the cup 180 degrees to pour it on the yogurt. Since it had been in the fridge, I had to use my spoon to get all the chilly flavoring out, which was of similar consistency as fruit preserves. I mixed up the flavoring with the yogurt for all the packages and they were all quite delicious. The trick for me to enjoy Fage is to use the yogurt as a delivery device for the fruit or honey. Then I have a snack that’s sweet, thick, and creamy in texture. However, I didn’t mix my yogurt up all the way and was left with a bit of plain Fage at the bottom. Without flavoring the Fage yogurt is too sour and plain for my tastes. However, some people have suggested that those qualities make it a good substitution for sour cream in recipes. I thought it was interesting the flavored Fage comes in 2% and Total, but not 0%. I can only guess that they think if you’re cutting calories you don’t want the flavors. So, you’ll have to provide your own honey or agave nectar for that style. Which is a shame, because I can’t be trusted with a whole bottle of honey and I’d probably buy a 0% flavor pack if it were available. You can find out more about Fage Yogurt on their web site. You can win some free yogurt too. Visit the BlogHer yogurt sweepstakes page here. Officer Krupke would give Fage a thumbs up if he had thumbs! I am Greek and I have to say that this particular yogurt is my favourite. Especially the 2% (with no flavours); I like it plain. It is just perfect!! It is perfect as a snack plain or with some nuts added, or with cereal added. It makes the most perfect tzatziki (greek garlic sauce)! People here and in the UK where I’ve live just love it! FAGE!!! Yeah!! (Sorry if I sound like I am advertising it, but it is my all time favourite yogure! I can’t believe I had no idea that the little “flavor” thing flipped up like that. I was always dipping my spoon in. This both makes me feel like an idiot, and has opened new worlds of ways to make a mess of myself. @Erica – I was thinking the exact same thing! I’ve spent so much freakin’ time digging the topping out with a spoon and thinking, “Wow, this package is poorly designed.” Duh! Of course I don’t have to remind you again that I love it. I especially love the Fage o% and the Chobani non-fat plain. I have heard that adding agave makes it extra yummy. I will have to give it a shot. Some people do have a hard time getting past the consistency. The 0% Fage is a great 90 calorie snack if you put Splenda on it. In fact, Fage is the only food that I really like Splenda on. I personally only use plain greek yogurt as an oil substitute in my baking recipes. But if I’m really hungry and need a snack to tide me over I LOVE LOVE LOVE Fage yogurt with honey, strawberries or peaches. I think my favorite is the honey one. YUmmmmmm! My fave is the 0% which I mix with a little SF Davinci’s vanilla syrup and a few sliced almonds. I tried Choibani for the first time this week and LOVED It! I will definitly give the fage a try now! Like you, I have tried Fage yogurt many times because everyone says it is so wonderful. I just can’t get into it unless it’s flavored with other things. I will second the last poster, though, who said it makes a great tsaziki sauce (and you’re right, it is an excellent sour cream substitute). Aside from being a tasty and delicious snack, I use it to make a light version of hummus and on baked potatoes. LOVE LOVE LOVE the Fage with Honey…the honey just tastes better than mine, I don’t know why. YUM. has great photos that will certainly get you even more excited for your trip! I avoid the flavored Greek yogurts due to the unnecessary sugar content, but I love the FF plain. And it does make a great substitute for sour cream. Last week, I used it to make onion dip and couldn’t tell the difference. I love this stuff, but never eat it plain. I add honey when I use it as a yogurt with fruit and granola. Or even better….use it on a baked potaoe instead of sour cream. We LIVE on this in my house. Or I use in any recipe that calls for yogurt…banana bread, etc. I ate some Fage 0% just yesterday with a Kashi pumpkin spice flax granola bar (half of a two-bar package) crumbled in. Yummy. I adore Greek yogurt. I do agree that, on it’s own, it’s a bit tangy for my comfort zone, but honey really does the trick. Fresh fruit is even better. My favorite breakfast used to be Weatabix covered in Greek yogurt and topped with berries. I think the first thing I’ll eat when I go back to America will be a full container of Fage. Mmm. I LOVE the plain 2% Fage. In fact, I make a 120 mile round trip drive JUST to buy it. Shameful, I know. @Erica – Same thing here! LOL! I always just dipped my spoon in the yogurt first and then into the fruit. 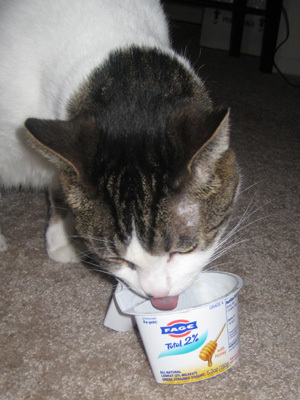 PQ – I LOVE Fage!! I love the Fage! I especially love the 2% best. I buy it plain and mix it with strawberries, granola and honey for breakfast (or a snack). I do get the 0% when I am trying to shave calories. I actually find Fage to be less tangy than other types of yogurt. It is great for making dips, too. I too am greek and I love Greek Yogurt but you are talking to a girl that eats plain yogurt on noodles just like my yiayia. But I digress I wanted to tell you that the flavored ones do come in 0% so you might want to talk to your grocery store about carrying it. Mine only carries the Total or 2% as well but Fage does make it. You could put jam in the 0% … but I think the 0% is really, really sour. I like the 2% and I mix in my own honey, fruit, or cereal. @Erica – Don’t feel bad! Here in the UK we’ve had packaging like that for ages for a yoghurt called Muller Fruit Corner (they now have Crunch Corners as well, with crunchy toppings in the flip-up bit). I always just spoon the fruity bit out. This is mostly because I don’t like to mix the whole thing up at once, and (maybe obessively) to ration the fruit out so I don’t have fruitless yoghurt towards the end, as PQ had. And also, if you wanted perfectly mixed fruity yoghurt, wouldn’t you just buy a cheaper, pre-mixed one? I get the Chobani because it’s usually a bit less $$ – the vanilla is good, not too sweet, but I like plain too. Add chopped peaches in summer, chopped pear in winter and because of all the protein it’s very filling. Moreso than regular yogurt. And don’t get me started on light yogurts. I am way too frugal (cheap!) to pay $2.00 for a little bit of Fage, so I make my own yogurt at home, in a yogurt maker. I use 2% milk, and when it is done I strain it to remove the excess liquid (whey). When it is finished it tastes exactly like Fage. I love it with thawed frozen blueberries and a bit of granola. It’s my favorite breakfast. This comment is regarding your tweet about the bagger at Marsh. Saying the “down syndrom bagger” is inappropriate. He/she is a bagger that has down syndrome. When you don’t use person first languge refering to people who have disabilities, it is demeaning. @Muzna Ahmed – I only had 140 characters. At first I did it phrase it that way, but it didn’t fit in the tweet, so I had to re-phrase. Yum! It’s kind of like rice pudding, only healthy and for breakfast. I love this stuff. I get the 0% and add a packet of sweetener (splenda or my new favorite, stevia) then add some mixed berries and a squeeze of honey or agave. I love the thickness! Great review! But I would add, it’s not just that Fage is thicker than regular yogurt, it is significantly higher in protein. A lot of people watching their diets will try to count yogurt as a ‘protein’ food, but unless it’s Greek like Fage, it really is a carbohydrate. Fage would count as a good source of protein, which is more filling/satiating than a ‘regular’ yogurt. That being said, I think it tastes the way I’d imagine Spackle to taste. But, try adding a sweetener with fewer calories, like Splenda to it, and it’s much better! I like to add my favorite protein powder (Jay Robb’s, in chocolate-which is sweetened with splenda) and that is pretty good. Kinda chocolate-y with a lingering sour cream taste. And it packs a really BIG protein punch! I LOVE Fage! I like the 0% and add my own honey and/or fruit. I like that it is actual yogurt and not a watered down yogurt like so many supermarket yogurts. And putting in my own honey lets me control the sugar. I also use it in place of sour cream on baked potatoes, tacos or stroganoff. Sometimes I splurge with the 2% for that but the 0% in so flavorful. Seriously, I should be the spokesperson for Fage because I love it so much. @Meghann – Can I get your hummus recipe? PQ I’m so glad you did this review. I spent ten minutes on Sunday last week picking up and putting back this yogurt! Don’t you hate those people in the grocery store? Just make a decision lady! ME too, and now I’ll be cured and can put the Fage in the cart and no one will get hurt. 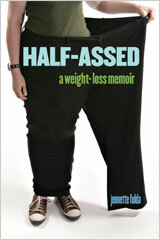 @Kelly – You may have just saved the breakfast portion of my never ending quest to lose the last 20! Thank you! That sounds delicious. Fat-Free Fage is a staple dessert at our house. We eat it with a little agave syrup or with agave and small amount of chopped walnuts, or frozen raspberries. We also use it as a sour cream substitute. The only drawback is the expense, which is huge. If we can’t get it at Trader Joe’s, we don’t buy it. We’ve also gotten used to a 4 ounce dessert portion, which is actually very satisfying. 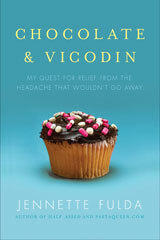 @Zoey – Totally agreed that people were missing the point, which is the high nutritional content. I used your trick yesterday on fat-free ricotta – add in a scoop of chocolate protein powder, a little water, mix; then cut up strawberries; it’s like chocolate cheesecake with mega-protein, no fat, and small amounts of carb. together with 2 pkg Splenda. or 1/2 cup = 60 calories. I don’t want to mess up my ongoing Love Relationship with 0%. I’m a big Fage fan, and my 3-year-old daughter loves it even more than I do. My favorite is their 5%, which is super hard to find. But, I’m working on losing a few pounds, so lately I’ve been eating the 0%, which is almost as good, when sweetened with a little agave nectar. I add a drizzle of honey or agave nectar to it, and then sprinkle the top with some Kashi Go Lean crunch. It’s my morning snack. For those of us on WW. Fage is definately 2 points-there is no fiber. I like to add splenda and vanilla extract or cinnamon. It works great a dressing mixed in with spices. @Sarah – here is my hummous recipe in case you dont get a response. Rinse two cans of chickpeas. throw them into a food processor. if you need more liquid then add water or olive oil. super yummy…toy around with it until you get it right for yourself. none of the measurements are exact. After this review I bought some to use in a recipe that needed ‘firm’ yogurt. Had to get 0% since Meijer’s other versions were expired! I think fat content would have helped the recipe but overall it was good, and as a vegetarian I’m always happy to get another easy protein source. I don’t like yogurt much but for the potato/pea/panir curry, Fage worked well! Glad you gave it another try! I buy the plain 2%, and use it for sour cream. When I want a sweet treat I add some pure maple syrup: absolute heavenly deliciousness! What is the difference it is still yogurt right? I think they have the same calorie content. I did the same thing–I tried to dig the honey out of the little receptacle (not very successfully–I couldn’t get it all). I didn’t realize the container folded like that. Duh. I’m not sure I’m that crazy about it, other than the honey flavor. It tastes a bit sour cream-y to me. I think I prefer the Greek Gods greek yogurt, which is a different thickness entirely. (Maybe it’s not real Greek style yogurt, I don’t know.) My favorite though is just regular (full-fat, sadly!) natural style yogurt. Mountain High brand is spectacular. I don’t know if it’s available everywhere though. I began eating Fage in 2005 when it was still being imported from Greece. It was a very different product to what most Americans know as “yogurt” from the typical grocery store, which is a gelatinous pudding-like confection of chemical additives and highly sweetened fruit/jam. 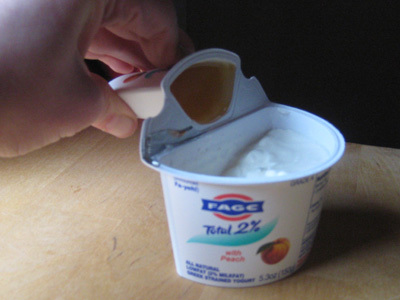 The imported Fage was thick, very creamy and had a pleasantly tart tangy flavor. Once production began in the US, the flavor changed drastically and although the texture is the same, the tang of real, natural yogurt is gone and it is bland, boring, and denatured for the American palate. Not everyone enjoys bland food nor overly sugared fare. I have written twice to Fage to express my observation, no response from the company. Very disappointing. I wish the imported version were still available somewhere.